After a quarterly miss Wall-Street is dumping Amazon's stock. Just don't sell your shares on because of the "too expensive" label. Few stocks, if any that I know of, get tagged with the "too expensive" label as often as Amazon (NASDAQ:AMZN). The conventional route for many "value" investors, may be to buy stocks with lower price-to-earnings multiples in the same space, such as eBay (NASDAQ:EBAY) or Overstock.com (NASDAQ:OSTK). As I write this article, Amazon's stock is down 9% on a "sub-par" quarter that still showed 20% sales growth. Simply put--it was a good quarter, so why the drop? Since Amazon misses most value investors short-list, only "shock the world" type growth can keep its stock price up. It shouldn't, this is a stock that even value investors should consider. Here's why Amazon is cheaper than it looks. While I prefer the oft-used price-to-earnings ratio as a valuation tool over ones that attempt to "predict the future" (such as discounted cash flow models or PEG), it may not be a useful tool when it comes to valuing Amazon. CEO Jeff Bezos has made a pointed effort to avoid the "quarterly earnings growth" game that Wall Street plays, in favor of reinvesting (a lot) into the business. Whether you applaud, or despise that decision, it's a well known fact. So what is a good tool to value Amazon by? In my opinion--sales. Since his landmark book Super Stocks introduced us to the price-to-sales ratio in 1984, Ken Fisher has used the tool to trounce the market. The ratio tends to be a better gauge of value because sales tend to be more consistent when it comes to tracking a companies performance, and it avoids valuing a firm on reinvestments in business operations. 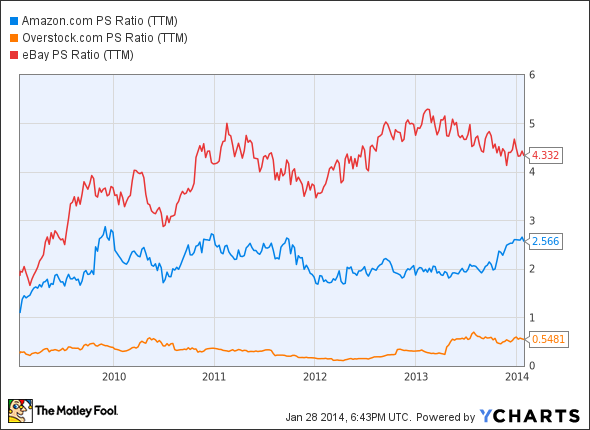 Here's a look at how Amazon stacks up with both P/E and P/S to its peers. Sure, Overstock.com still has a lower P/S ratio than Amazon, but it's hard to say it's cheaper because Amazon has so much intangible value. Amazon is a business that can win on many levels (with either products like Kindle, or from its sites) and is a "best of breed" business in e-commerce. You could argue that the success of eBay's Pay Pal unit makes it a "multi-level" performer as well, it does, but Amazon has the better growth rate and a cheaper P/S ratio than eBay. The point isn't that eBay is a "bad" business or that it's expensive (it's neither of those things), the point is that Amazon is a whole lot cheaper than its own P/E (1,340) would lead you to believe. In fact, the P/S ratio's of this group have remained eerily consistent over the past five years, as the chart below shows. This would suggest that despite the run-up in share price, and the higher P/E, Amazon is about as cheap (or expensive) as it's always been. If there was one thing I would change about the way value investors think, I would get rid of their obsession with numbers. The truth is, valuing a really great business is harder than simply "screening" for stocks, because it involves putting a value on intangibles like management, and brand identity. There's no doubt that Amazon has both of those assets in spades, yet they those assets do not show up in book value. More than anything though, you must understand that this is a growth company. To me, you value a growth company in a relative manner, by assessing its addressable market. Amazon is the undisputed leader in e-commerce, yet e-commerce still only makes up about 6% of all retail sales. 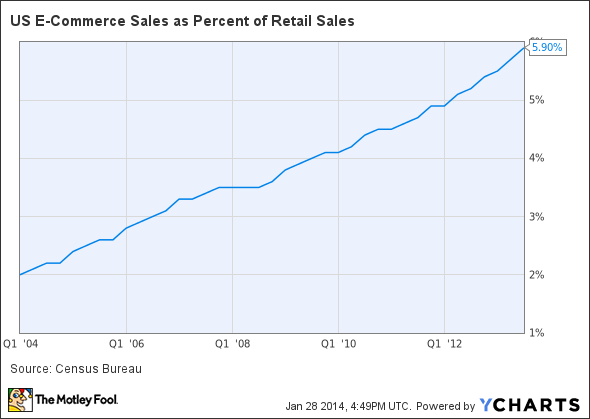 This chart, and a surprisingly weak holiday quarter for traditional retail, show e-commerce is growing rapidly. Yet with such a small piece of the pie, there's no reason to think that Amazon cannot continue to grow revenues at current rates. There will be bumps in the road (ala, an increase in "Prime" membership costs), but long-term, it's hard to deny where e-commerce is going. It's going up. I am by no means saying that Amazon is a cheap stock--it is expensive. Like golf clubs, food and wine, and cars, you pay a premium for quality businesses. I'm simply saying that, on a relative basis, it's actually valued much closer to its peers than its P/E would suggest. Translation: even with slower growth, you shouldn't tag this stock with the "too expensive" label based on earnings alone. If you give it some more thought, this one might end up on a few value investors short-lists after all.